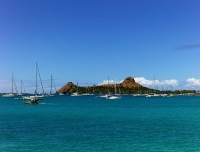 Pigeon Island, north of Castries, is St Lucia's first national park, reached from the mainland across a causeway. The islet has a romantic past, having been the hide-out of Jambe de Bois, the much-feared peg-leg pirate who preyed on Spanish galleons. It was also from here that Admiral Rodney set sail in 1782 to destroy the French fleet in one of the most decisive sea battles in European history. Pigeon Island features two white sand beaches and an interpretation centre, where a multimedia display explains the local history. The centre includes the Captain's Cellar Olde English Pub, a re-creation of an 18th century English pub. The island is ideal for nature walks and has numerous marked trails which bypass historical sites, like the remains of an 18th century British fort.